When you think of Neverland, you probably think of adventure and fantasy and infinite play, but there is a dark, irredeemable side of Neverland that we rarely confront. For the first time, we are seeing digital rhetorics open the sky of possibilities to play and write with purpose. Wendy and her brothers leave a comfortable and familiar home in London for the adventures that await with Peter Pan and the Lost Boys in Neverland. So what makes it dark? Well, Neverland is timeless, and this quality is part of its appeal. Peter Pan has no memory, and without time or memory, imagination becomes his identity. Wendy, though, is the one to be admired: she wanders with a purpose and finds an important balance between the spontaneous play of Neverland and the controlled play of London. But here’s the catch: she had to go home to do it. 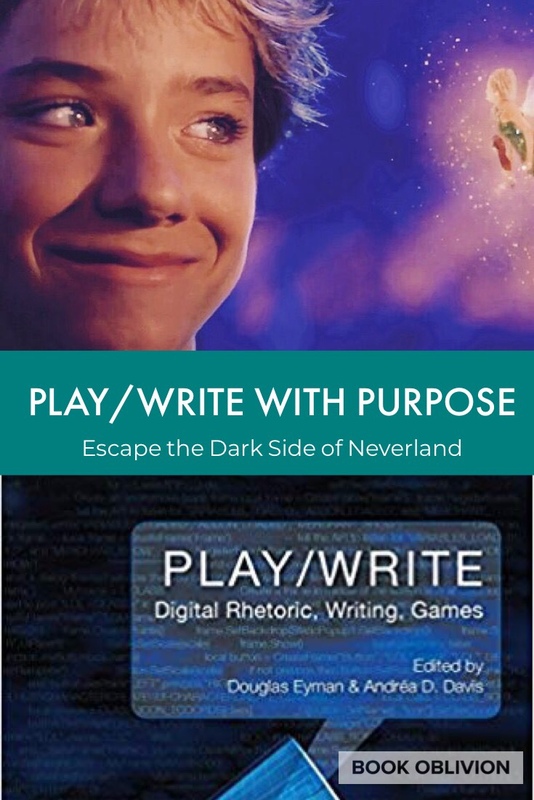 You see there is an important difference between the kind of play Neverland perpetuates and the kind of play possible when you visit Neverland in your imagination. The tendency is to think that Wendy and her brothers return to London and fall back into the social order, pursuing a life-sucking job, just like their father. This is the modern day equivalent of pursuing money and status while emphasizing efficiency over creativity. But I suspect traveling to Neverland left Wendy and her brothers forever changed. Through the timelessness of Neverland, they learned the greatest lesson of all: time is a gift — and it’s up to you to redeem it. Redeeming the time requires childlike wonder and curiosity and a willingness to wander. This is the posture of the gamer. The impulse to produce and make is part of who we are. This is most fully actualized in the space of the game. In an essay within the collection titled, “Procedurality as Play,” Grace Hagood moves toward Richard Lanham’s approach to video games as digital dramas in The Economics of Attention: Style and Substance in the Age of Information. Hagood describes the environment in which this impulse to play thrives: you need both Paidia and Ludus. The Greek concept of Paidia which is the idea of spontaneous play and Ludus: which is the notion of controlled play. A prominent example of this is the 2003 iPod experiment at Duke University that Cathy Davidson discusses in Project Classroom Makeover from her 2011 book, Now You See It: How Technology and Brain Science Will Transform Schools and Business for the 21st Century. In giving an entire freshman class of students free iPods, students invented ways to use them for educational purposes, which laid the foundation for what we now call a smartphone. Like Grace Hagood points out, Samuel Taylor Coleridge advocates a kind of purposeful wandering that characterizes invention. And this is precisely why Wendy is the heroine, and Peter Pan is the dark, tragic figure. In choosing to never grow up, he squanders the gift of time, forfeits his memory, has no ability to love, and will forever remain a wanderer with no purpose. But I suspect they are forever changed. 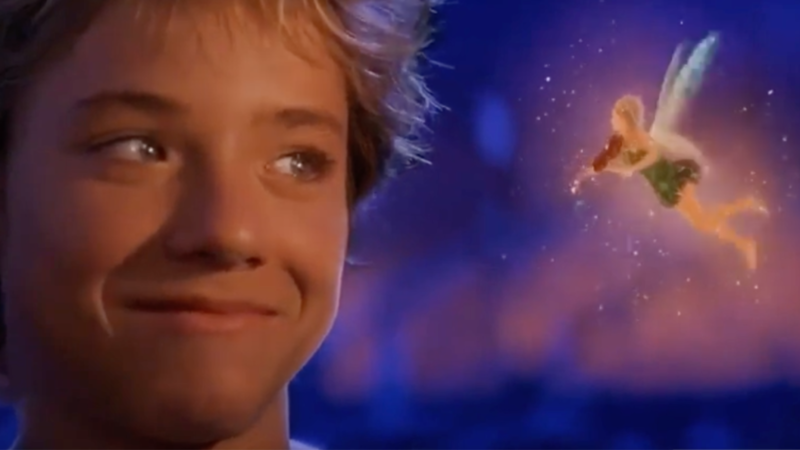 Peter Pan is a timeless story because the tension between the kind of childish play that Neverland represents, and the kind of childlike play you can find in games, continues to pulse in our contemporary moment. When you give a child a sandbox, or a hacker a system, or a reader a book, the possibilities are endless – kind of like an open sky. Here is the thing: J.M> Barrie’s England, of the late 19th Century was a stifling place. The factories were stifling; the Social Clubs were stifling; Buckingham Palace was stifling (and arguably, still is). It stood to reason that someone would create a character who would represent an unbridled imagination. The power to dream, like faith in a higher power, can seem to be repressed by society or a government, but it can never totally disappear. When an individual manages to repress the power to dream, the result is long-term psychosis. When a government manages to do so, the result is a morose, laggard populace. I am fortunate to have had a mother who urged us to engage our imaginations-preferably to solve problems, but also to treasure life.